19. århundre gårdshuset ligger ved foten av de hvite fjellene. 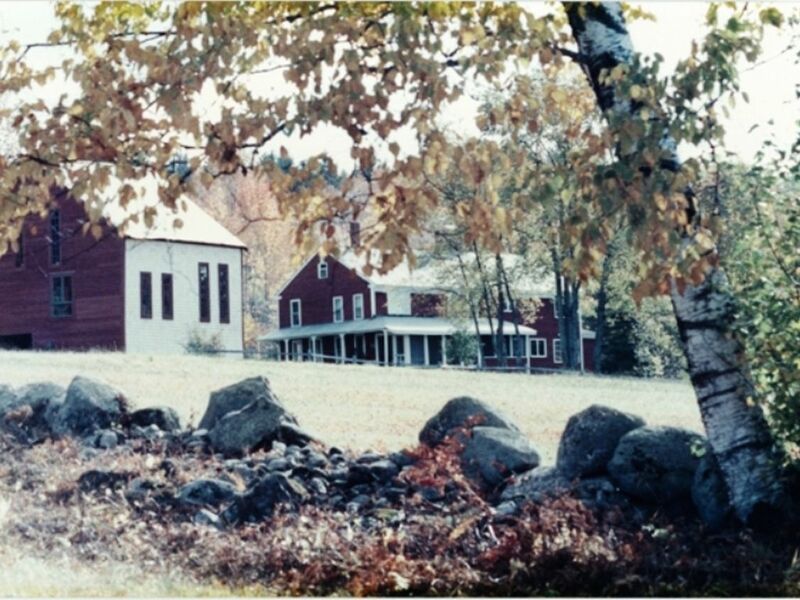 Ligger i Sverige, USA - mellom Lovell, Fryeburg, og Bridgton. Seks soverom, tre bad, og en overdimensjonert kjøkken som har den originale peis ildsted med granitt mantel og murstein ovn. Kjøkkenet har utgang til en romslig skjerm veranda med lange bønder bord for servering om sommeren med vidstrakt utsikt over fjell og fantastiske solnedganger. Privat villmark strand med sandbunn er perfekt for småbarn og svømmere i alle aldre og ferdigheter. Beach inkluderer cabana, kajakk, kano og svømme flåte. Det er ingen motorbåter tillatt på sjøen. Våningshuset sitter på et lite fjell på 25 dekar blant to åpne felt med en fantastisk panoramautsikt over Presidentials og de hvite fjellene. Den private stranden, omgitt av dype skoger med slående utsikt over granitt mountainface, ligger på sjøen, 1-1 / 2 miles fra huset, en enkel 3-4 minutter unna. Teltplattform med brannpit på eiendommen. We thoroughly enjoyed our stay at the farmhouse. The view is stunning... even better than the photos let on. The house itself was beautiful and incredibly interesting to study, but felt comfortable. Plenty of room for 8 adults, 3 kids and dogs. Beach was shallow, warm and sandy with another great view. Easy access to Conway and Sebego areas, and Bridgton (10 min away) was darling. The downsides: house is immediately on the road. The sitting area is away from the road and behind a thick hedge, but close enough to hear cars and make us nervous with dogs and kids. The beach was a 2-3 minute drive through town, not the pond behind the house that you might assume from google earth. No gas grill. Overall we would strongly recommend the farm house! Great place for family vacation. Sounds idyllic? It is. We hope to return. Our family group was larger than usual and we needed a bigger place than we had rented in previous years. Although it wasn’t lakefront, the nearby pond sounded inviting and seemed close enough. It turned out to be as good as private, we only saw one other person during our numerous visits to the shallow sandy beach. Being able to walk out to the float raft was ideal for granddaughters and elders.The kayak and canoe were great for exploring the pond and the float toys kept everyone busy while the chairs provided places to comfortably doze in the shade. The house itself was perfect for our needs with both nooks and crannies for privacy and “public” spaces for games and puzzles. We ate on the screened in porch at dinner time and watched the sunsets In the distance.We recently, and reluctantly, sold the family farm and the old farm house that belonged to my wife's family. This house seemed familiar and provoked memories for all of us. The beds were comfortable, fans in every room and household supplies and furnishings like I have never before seen in a summer rental. Books, puzzles and games galore.Tools to fix any possible problem, but there weren't any problems to fix. The owners left directions and instructions for any conceivable issue that might arise. If someone had a question we would look at the handout and find the answer. The grounds were well tended and we walked the fields with lots of bird life around us. In the morning it was fun to see who were the visitors of the day, wild turkeys, some unfamiliar birds, or squirrels. There was no shortage of written material to identify the unfamiliar, whether bird or tree or butterfly. The tent platform beyond the carriage house was a good place to watch the mountains and have s'mores from the fire pit. Finally, the location was convenient to Lovell and Bridgton for shopping,eating out,etc.The TV was amply supplied with DVDs, but we are readers and didn't use it although the wi-fi was busy as a substitute for the newspaper. The first Sunday we all headed to Ebenezer’s Pub and lunched as we watched the World Cup. We took advantage of the entertainment at the Brick Church in Lovell when Maine’s own Don and Cindy Roy (National Endowment for the Arts 2018 National Heritage Fellows)performed.We picked strawberries and raspberries, got great blueberry pie and had wonderful brick oven pizza at Pietree Orchard just down the Waterford Road road a bit. The house was a perfect place to relax and enjoy life. The farmhouse is truly a step back into the early 19th century with sweeping views of pastures and distant mountains. Our extended family of 10 had plenty of room for games, puzzles, indoor and outdoors dining, comfortable sleeping spaces and bathrooms! Grandchildren wandered in wildflower fields picking wild blueberries and swam and boated in the clean sand bottomed lake. Wonderful hiking less than an hour away in New Hampshire's White mountains or just around the corner in Maine. An idyllic family escape from our daily hectic worlds. Highly recommended. Thank you for your kind words and we hope to see you again next summer! We are a family travelling from France to discover New england. We loved the house which was spacious clean very charming in a very quiet location with stunning views over the mountains, great stars at night. It is close to bridgton with all amenities and lake beaches. Would strongly recommend it! Thank you Sandra for your kind words! We trust that you enjoyed the rest of your New England holiday and had a safe trip back to France! There is something for everyone at this absolutely gorgeous property. The house furnished beautifully and the assortment of accommodations suited our diverse group perfectly. Despite our large group, there was enough space on the property for everyone to spread out and we did not feel the least bit crowded. Our group included 4 generations with ages ranging from 8 months to 70+ years. We also had 2 dogs with us and a good time was had by all! The young and the young at heart in our group enjoyed swimming, boating, relaxing, hiking, photography, antiquing and puzzling. Would heartily recommend to anyone looking for a picturesque spot just close enough to the white mountains. And as an added bonus, the blueberry picking was superb! We had an amazing time and we couldn't have asked for a more pleasant and beautiful place to relax, rejuvenate, and reconnect with family. We hope to stay again in years to come! Thank you for your kind words and we hope to see you again in the years to come! My husband and I were blessed to have our very small, intimate, outdoor wedding in one the gorgeous fields and it was everything we hoped it would be. We stayed for the remainder of the week as our family vacation/honeymoon and it was delightful. The house has an immediate feeling of comfort, much like the one you get when you return home after being away for a while. The antique style suited us well and the entire house is furnished with nostalgic, classy touches. We had everything we needed, especially in the kitchen and this saved us a great deal of packing/unpacking. While there is a TV and I understand that the internet is coming to this corner of the world, we greatly appreciated the opportunity to detach from our online habits and instead spent solid quality time playing games, reading books, playing music, and cooking big meals that were enjoyed on the screened porch with a breathtaking view and magnificent breeze. The porch and kitchen were our favorite rooms to spend time in. Walking the fields at sunset was unforgettable. The yard is so beautifully landscaped; it reminded me of the secret garden at times. And finally, the beach was beyond serene. I've never had a more private, peaceful, wilderness beach experience and I've lived in Maine almost my entire life! We left feeling totally satisfied and with many unforgettable memories. Telt plattform med bål på eiendommen. $1950 a week. Weekly rental only. Saturday-to-Saturday only. Linens included. (Not including beach towels.) Pet friendly. Tent platform with fire pit on the property. Rentals are subject to 9% state tax.